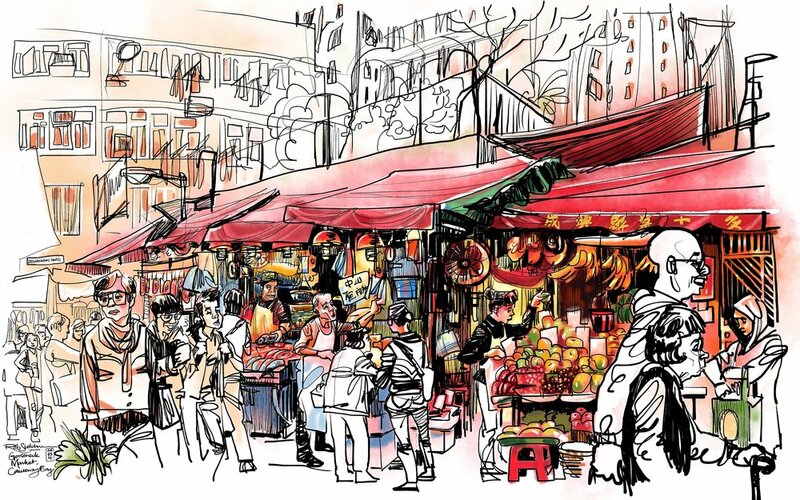 This is an early piece I did at a market in Causeway Bay in 2014, which helped people realize that iPads are actually a viable creative tool. The iPad Pro + Apple Pencil + Procreate combination now turns what was pretty incredible into an amazing, liberating creative toolkit. Sketching and painting on an iPad has now been around for about 10 years, with adoption really picking up after Apple introduced the iPad Pro 2015. Pair that with the wonderfully responsive Apple Pencil, and people all over the globe, including urban sketchers, artists, illustrators and creatives of all stripes, have been turning to Procreate to conceptualise, sketch and paint on their iPads. And now you can too. Like any tool or medium, there is a learning curve, so this workshop is structured in small steps to get you comfortable with Procreate through a series of demonstrations and exercises. Consisting of three sessions over a two days day, iPad Sketching Workshop is a carefully-paced immersive deep-dive, designed to get you up and creating art on your iPad, even if you've never dabbled in digital drawing before. Demonstrations, exercises and time to sketch on location are carefully integrated into the workshop so you can begin to master skills learned, ask questions, and get one-to-one guidance as you work. You will leave iPad Sketching Workshop feeling much more confident about whipping your iPad out whenever inspiration strikes! We'll learn key tools and principles indoors, then head out to draw on the streets... and Rob will be there to guide you and answer all questions. Indoor sessions will be held at H6 Conet, the Center, Central Hong Kong, with outdoor session in the surrounding neighborhood. Both sessions of this workshop will be held in Central, Hong Kong. The indoor portions of the workshop will be held at at H6 Conet, The Center, 99 Queen’s Road Central, Central, Hong Kong. We begin with an introduction of the instructor and potential of Procreate. Also discussed are helpful gear and accessories, especially screen protectors and iPad holders. A series of demonstrations and quick exercises will familiarize you with Procreate and its interface. You will then learn how to customize important settings, set up favorite tools for optimal use, see what effects are possible, and create personal digital toolkits. Working with an iPad and Procreate requires an understanding of how working digitally is different from traditional media. A set of exercises will help ease you into this process. You’ll then practice what you've learned through sketching exercises that help cement the concept of a digital workflow. Apply what you've learnt to do simple sketches while the instructor goes among participants, offering guidance. The session ends with a review of work, lessons learned and a Q&A. You are encouraged to practice and play with what you’ve learned this evening so you join us again on Sunday with more confidence and questions. There are 130+ brushes in Procreate. Learn which ones to to start with. Learn how to mix colors and create your own palettes. Most users of Procreate want to know how they can get the look of their favourite traditional mediums before exploring other aspects of digital potential. This segment explores the most common media styles and how you might replicate them digitally. We then look at ways to go beyond that. We then look at how your workflow can be applied to tell your own story. Whether you plan to travel sketch, make visual notes on a museum visit or simply ideate, we will explore tools and features in Procreate for various purposes, including how to take advantage of layers, planning layouts and composition, object manipulation, lettering & calligraphy. You now apply what you’ve learned through the day to produce a more finished composition while the instructor goes among participants to offer guidance. We will end the workshop at H6 Conet with a review of work, sharing lessons learned, followed by a final Q&A. Workshop Fee: HKD 2000.00. Payments through PayMe / Bank transfer. Maximum number of participants 15 (minimum 8) All levels welcome. *Please note: In the event of too few registrations, all monies will be refunded. All payments are final, and no refunds will be entertained. Thank you for your understanding. This workshop requires an iPad that works with the Apple Pencil. In addition to all 3 generations of iPad Pros, the 2018 9.7” iPad is a good, affordable, entry-level iPad which also works with the Apple Pencil. Preinstalled Procreate app (HKD 78.00 or equivalent on the iOS App Store). Please update the app before attending the workshop. Rob Sketcherman is an artist and illustrator from Hong Kong who has been using the iPad exclusively as his creative device for the past 4+ years. 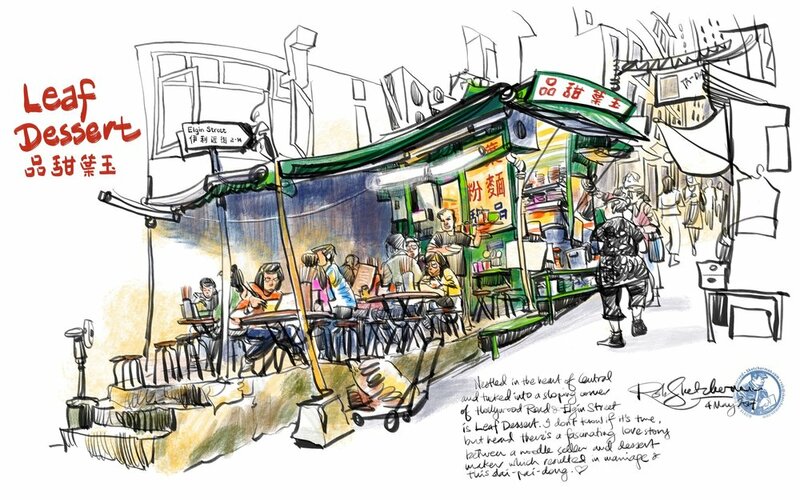 He is one of the 5 administrators of Urban Sketchers Hong Kong. While not sketching on the streets, he handles illustration commissions of all kinds, and is often invited to speak, demonstrate and run workshops internationally on his artistic and professional work on the iPad, including at Apple and various educational institutions. I was able to do this at the back of a cab during a crazy 45min traffic jam between Central and Causeway Bay because I use an iPad. You could too! When you don't have to worry about space for paint, water, palettes and other gear, or people stepping on your equipment, pieces like this are possible, even in really tight, crowded (1 million+ people! ), standing up at night. Fatima, Portugal, 2017.